The London Cosmetic Clinic is proud to offer the latest PROFHILO injectable treatment which is the latest innovative approach to anti-aging treatments. This revolutionary treatment bioremodels the skin acting directly on skin laxity and nourishing the cells. This restores the firmness and hydration of the skin. All procedures are carried out by our highly experienced doctors at our clinic in Knightsbridge, London. 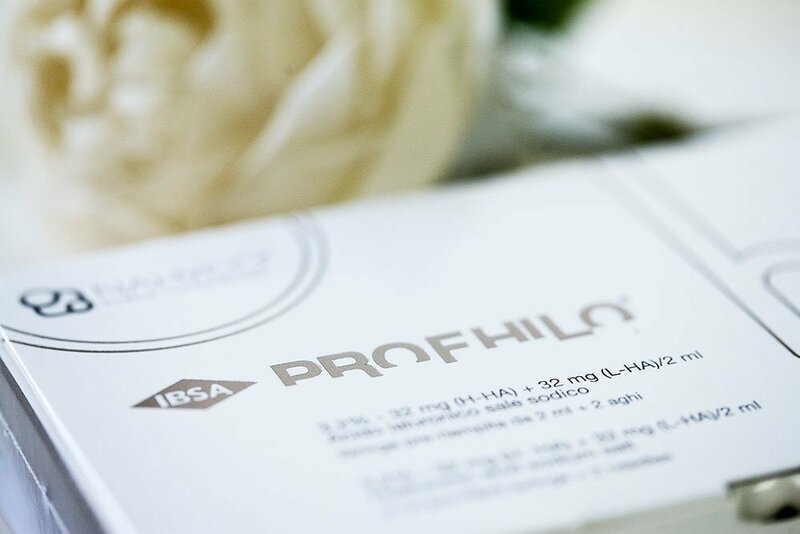 PROFHILO has one of the highest product concentrations of Hyaluronic Acid in the industry, thus enabling it to not only boost and hydrate the skin, but also remodel sagging tissue. This is an excellent, affordable option for patients who want natural results with minimal downtime or discomfort. Who is suitable for the PROFHILO treatment? PROFHILO promotes radiant skin by rejuvenating, stimulating collagen and elastin production and hydrating the skin. What does the PROFHILO procedure involve? The experienced specialist doctors will carefully examine your skin to ensure you are suitable candidate and will thoroughly explain the procedure, benefits and risks prior to the procedure. The BAP technique maximises the diffusion in the malar and sub-malar areas by specifically chosen in anatomically respective areas involving 5 injections per side. The gentle and slow injections offer maximum comfort during the treatment. In some areas that have high chance of bruising, the special blunt needles (cannula) can be used. Once injected, the product immediately starts spreading due to the high concentration of HA and its cohesive nature. You should avoid touching or applying make up on the treated area for 6 hours in order to prevent infection. The treatment areas can appear slightly bumpy and raised post treatment. This will reduce by the next day. Specific post treatment instructions will be given during your visit by our Clinic Coordinator. Q. Which type of product is PROFHILO? PROFHILO is not a dermal filler, it is different from all other injectable substances as it has been engineered for “skin bio remodelling”. It is biocompatible because it is composed of highly pure grade hyaluronic acid produced by bio fermentation. This fantastic treatment enables effective production of both your natural collagen and also your elastin which enables your skin to renew successfully, from within. Due to its intensively high purity and the absence of additives, PROFHILO offers greater safety and therefore reduced side effects. Q. What is the down time? The down time is very minimal. The redness and swelling after treatment will generally subside within a couple of hours or maximum, up to one day. It is recommended to have 2 sessions (one month apart) to achieve the maximum results. However, if the skin problems are severe, the third session could be done 2 months after the second session. In order to maintain the results, one treatment session is advised every 6 months. Q. How long will it take to start seeing a result? The results are usually seen after two quick treatment sessions, with a one month interval between them. An increased firmness, elasticity and an overall improved quality of the skin is seen after the two treatments. Maintenance sessions are required 6-12 monthly depending on the degree of correction required, your age and lifestyle. Your doctor will provide you with a full treatment plan during your initial consultation. Q. Why should I have the treatment at The London Cosmetic Clinic? Dr Johnson is one of the best and very professional. The treatment was so professionally done and I always felt happy that I was being well looked after during the entire process. I just wanted to share a quick note and let you know that you guys do a really good job. I’m glad I found you. You all made me feel comfortable and beautiful.